Here are several shortcut commands that are useful in your web browser. These commands apply to Firefox, Chrome, IE9, and Safari. Tabbed pages are very useful: they let you open multiple web pages simultaneously without the same memory load as a full browser window. Simply press CTRL-T to launch a new tab. Related: use CTRL-Page Up and CTRL-Page Down to navigate between the tabs. Once you have pressed ALT-D to focus on the browser address bar, you can save yourself even more typing. Since many website addresses start with ‘http://www.&#8217; and end with ‘.com’, your browser will offer to type those portions for you. You simply type the middle portion of the address (called the mid-level domain). Your browser’s address bar (aka ‘URL bar’) is where the website address goes. Instead of reaching for your mouse to click the address bar, try ALT-D on your keyboard. Like all ALT commands, you hold the ALT key while you poke the ‘d’ on your keyboard. Result: your computer focuses on the address bar, and block-selects the entire address, ready for you to type over top! To save the current web address as a bookmark/favorite, use CTRL-D on your keyboard. A dialog box (mini window) will pop up, and suggest a name and folder. If you like the suggested name and folder, press Enter on your keyboard. Is the font too small or too large? Simply hold CTRL with your left hand, and spin your mousewheel with your right hand. This will zoom the web page and enlarge/shrink the font. This is wunderbar for those of us with weaker reading vision! When you no longer want the web page tab open, press CTRL-F4. This keystroke will close the current tab page while still leaving the web browser open. Instead of clicking the ‘back’ button on your screen, try using your keyboard backspace key instead. As long as you are focused on the page and not the address bar, backspace will reverse you one web page into the past. Related: Safari web browser also uses CTRL-(Left Arrow) to reverse one page. This is ideal for news pages, or for any web page that didn’t quite load correctly. Press the F5 key to force your web browser to get a fresh copy of the web page. Slow web pages happen often. If you do not wish to wait for all the graphics and animation to load, simply press the ESC (escape) key at the top left of your keyboard. It is the same as clicking the red X button beside your address bar. Sometimes, a single click will not highlight-select the whole web address. If this happens, simply triple-click the address with your left mouse button, and it will highlight-select all the text for you. This is a universal keystroke that works in most any software. Once something is highlighted-selected, press CTRL-C on your keyboard to copy that item to your invisible clipboard storage. Once something is temporarily stored in your invisible clipboard, it can be pasted repeatedly by CTRL-V. In case you are wondering why the unsual keystroke choice, it is because CTRL-P is reserved for printing. If you forgot the administrator password you can easily reset the password on Windows 7, Windows Vista and Windows XP with the Sticky Keys tricks. It works always. Here is the Trick.. Visit Michaels Page for more helpful tips. Forgot the administrator password? There are many ways to access a Windows installation if you forgot the administrator password. Today I’ll show you another procedure to reset the Windows password by replacing the Sticky Keys application. This program allows you to use the function keys SHIFT, CTRL, ALT, or the Windows key by typing one key after the other instead of pressing them simultaneously with the second key. The main advantage of this password reset method is that you don’t need third-party software; another plus is that it is easy to carry out because no Registry hack is required, as when you offline enable the built-in administrator. Please note that resetting the password from an account other than the corresponding user account always means that the user loses the credentials stored in the Windows Vault, stored Internet Explorer passwords, and files that you encrypted with the Encrypting File System (EFS). Of course, if you have a backup of these credentials, you can restore them; likewise, if you have exported the private EFS key, you can import it again after you have reset the password. Like with all other solutions that allow you to reset the Windows password without having an account on the corresponding computer, you have to boot from a second operating system and access the Windows installation while it is offline. 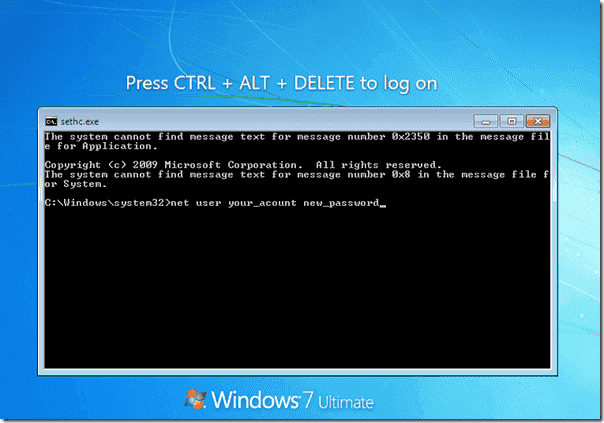 This works because Windows RE, which is based on Vista or Windows 7, will let you launch a command prompt with access to an offline installation without requiring a password. Boot from Windows PE or Windows RE and access the command prompt. Find the drive letter of the partition where Windows is installed. In Vista and Windows XP, it is usually C:, in Windows 7, it is D: in most cases because the first partition contains Startup Repair. To find the drive letter, type C: (or D:, respectively) and search for the Windows folder. Note that Windows PE (RE) usually resides on X:. Why pay Top Dollar for your Computer and Software? Did You Know the majority of computer manufacturers offer a discount for Students, Teachers, Government Employees, Librarians, Non Profits, Also Your Employer may have a Discount Plan as well. Here are a few Links to Discounted Pricing from Manufacturers. Your System Restore Disk, Do You Have One? Better Make One!!! Most Computer Manufacturers No Longer Supply You with a Recovery CD or DVD. So what are you going to do when Your whole computer Crashes? Your Computer Probably Includes the Software to Create Your Very Own Set. Not Every Computer Manufacturer has this, so Hopefully Yours does. Make sure you create a Disk or Disks, ASAP or when you first hook up your new computer. You will need these one day when either your Hard Drive Dies or you get a massive Virus or Trojan. Then What are you going to do if you don’t have a Recovery CD? Run out to your local Computer store and Pay for a new copy of Windows? Lotta Money and way more work than Joe average wants to deal with. Then You will Probably call your Local Geek and there is more money. So Spend a little time and make your Recovery CD-DVD’s NOW…. and save yourself the headaches later on. It is a Machine and it will either get a Virus or something that will erase or damage your information. Your Hard Drive… which stores all your programs, files, emails and photos will also die one day. When this happens, EVERYTHING IS GONE. (Well there are Hard Drive Retrieval companies out there that will for a NICE FEE, Get Your Information back) But Why? Just go Buy an External Hard Drive and use the Software that comes with it and have it back up your computer everyday. Set it and Forget it!!!! Your Internet Provider may offer online storage, Check Your Account to see if it may be included. You may already be paying for it and not using it. There are Companies that do Offer Online Backups and Storage for your Computer. Dropbox Up to 2GB Free Storage. By Now You probably have had a Virus, Trojan, or some sort of Bug in your Computer. Yes you can Pay for Antivirus and or AntiSpyware software, and STILL Get a Virus or Bug in your computer. So What Should One Do You Ask? Keep Your Antivirus and AntiSpyware Updated. try another online FREE antivirus scanner or another FREE Antispyware program. FREE ONLINE ANTIVIRUS SCANNERS Try these Links Out.